The ever-present chili oil of Chinese restaurants adds a very pleasant kick of spices to almost every Chinese dish. It is a must-have if you enjoy Chinese food on a regular basis. We used to buy it by the case loads from the Asian superstore, until we realized how easy it was to fabricate it at home. Yikes! That only means we are now consuming it more than ever! 1. In a heavy-bottomed saucepan, over low heat, heat 1/4 cup of oil with garlic, ginger, and the spices until they start fizzing, making sure that they do not brown. 2. Add the rest of the oil and simmer on low heat for at least two hours until the oil is infused and fragrant. 3. Meanwhile, in large, steel mixing bowl, stir together the chilies, peppercorn, salt, and soy sauce. Set aside. 4. When the oil is aromatic, strain it through a sieve into the bowl of chilies. 5. The oil may start to foam, do not worry, this is good news. 6. 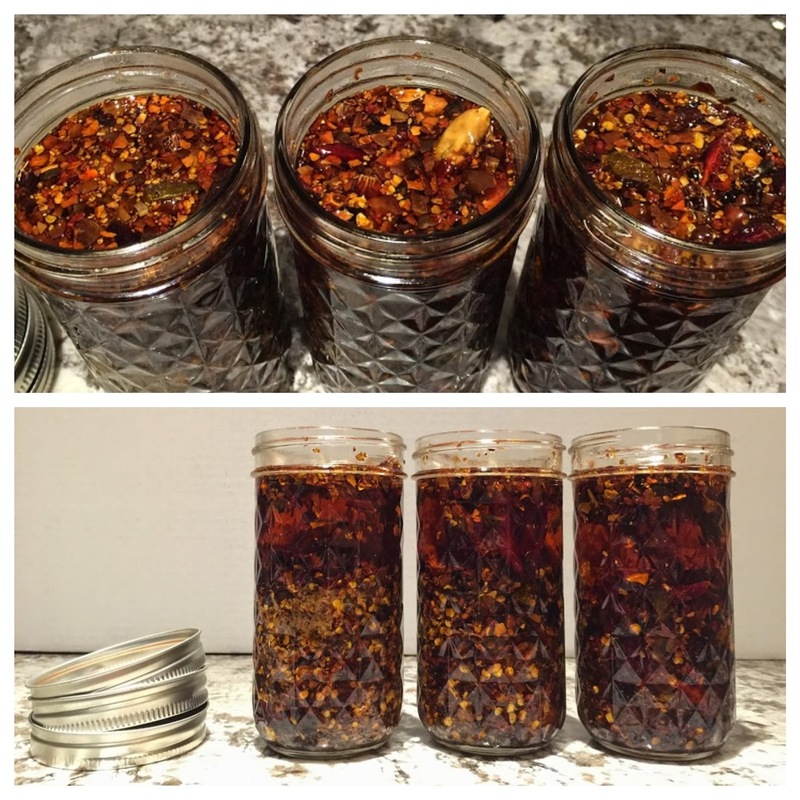 Once cooled, store the chili oil in jars, making sure you ladle an equivalent amount of oil and chili into each jar. 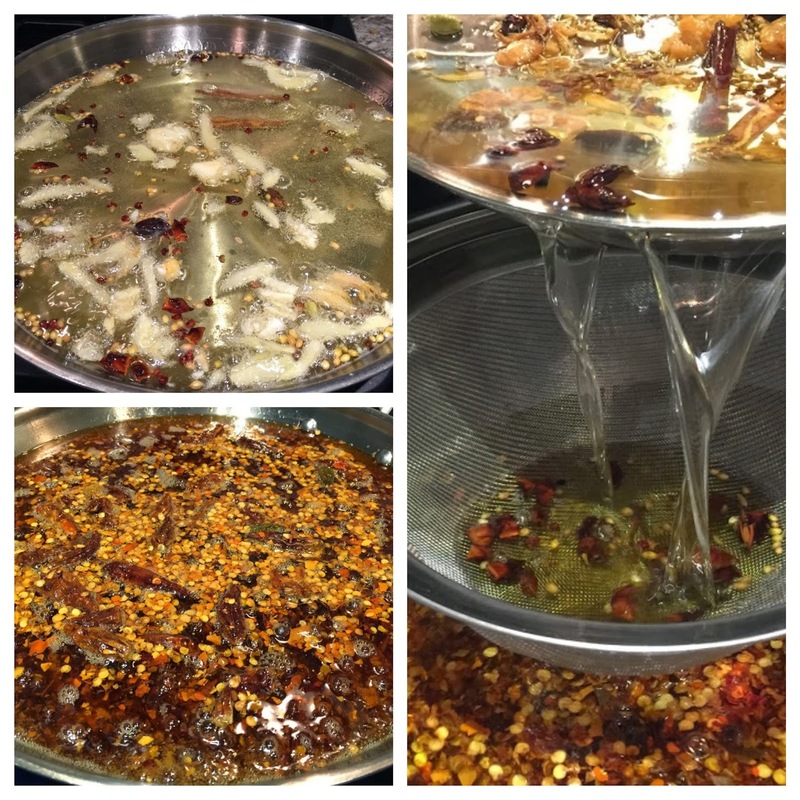 The chili oil may be consumed immediately, though the oil will absorb more flavours if you wait a couple of days. Store in a cool, dark place.